These works are driven: romantic yet thorny, expressive with edge, concisely expansive with high-wire drama and keening melodies. A brilliant flute concerto—TEMPEST— with virtuoso flute soloist Gareth Davies of the London Symphony Orchestra. A dense, passionate and personal three movement orchestra work—UNFINISHED EARTH—teeming with heavy emotional edge and tenuous line. 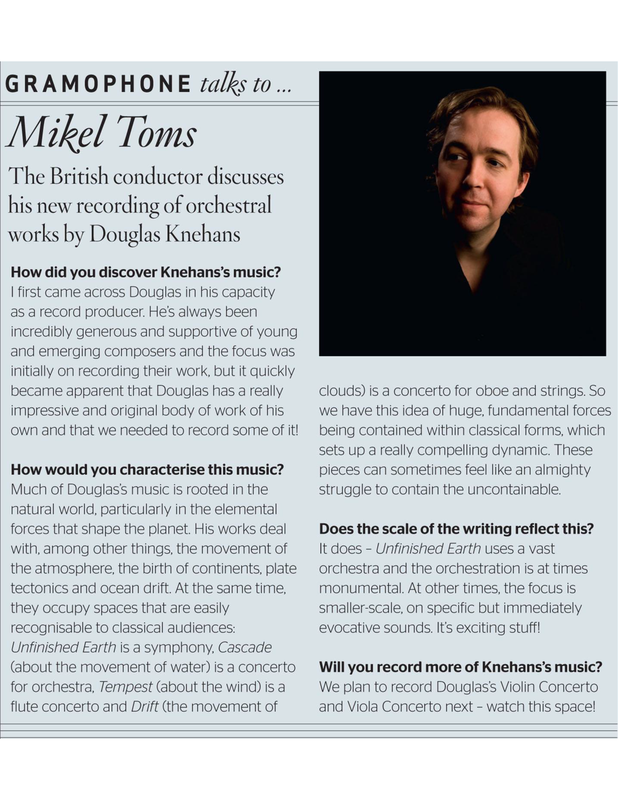 Reminiscent of Lutosławski, Stravinsky and Mahler, this is powerful contemporary music from a new individual voice, with brilliant and exacting performances by the Brno Philharmonic and conductor Mikel Toms. These two works represent different views of how the external metaphors of wind and earth may be shaped to reflect the more intimate internal worlds of the human heart and mind. Tempest, my flute concerto, was shaped by the thought of wind—such an essential element to the flute and flute playing—and how, in the natural world, this courses across the planet in different ways from benign to hostile. The three movements reflect different wind patterns found around the globe and served as a departure point for a three movement work cast in a quasi-classical frame of fast-slow-fast structure. Each movement engages a message, I hope, beyond mere tone painting, to reflect deeper aspects of the human condition, the human experience, thought, reflection, psychology and emotion. Unfinished Earth is a longer and deeper work, again cast in three movements, and delving into the constant degradation and reformation of earth and sea. Just as the earth slowly changes and evolves, we ourselves are constantly evolving through the deepening of our life experience, the processing of life’s joys and tragedies, and the inner passage of our turmoils and triumphs. Tempering, the first movement, is about the formation of earth and the molten rock that is risen from the subterranean earthen smelter to become land. For me, this is a movement about becoming, and through such becoming, firming in our senses of self, just as earth does as it becomes land. Eternal Ocean, the second movement, evokes the shifting currents of deep ocean, again, as a metaphor for the unfocussed and at times even conflicting currents of the inner emotional worlds of the human experience. The final movement Tearing Drift is again a work with multivalent meanings: some referring to the ripping apart or fractures in the earth’s surface as might happen in an earthquake perhaps; to the alternative meaning of the first word of the title not as being torn but as crying. This notion of an earth cry or deep subterranean swell of grief was a central image and intent of this movement. The strident wind and brass microtonal peals and screams against the strong percussive thrust of this movement was intended to reflect such an earth cry—or even the Munchian silent scream of isolated man. 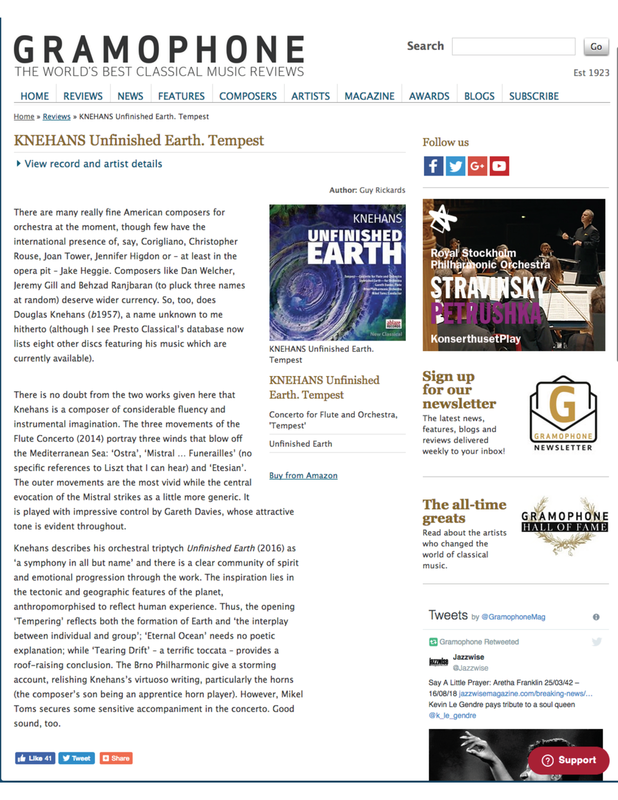 "... the sounds of nature course through the orchestral pieces on his latest album "Unfinished Earth," with a primitive force and melodic insistence that recall Stravinsky." **** "...wonderfully orchestrated... dynamic and endlessly evolving..."
“Unlike many of his colleagues, Knehans does not write music coming close to film music. His tone poems always are an expression of dramatic sensations or of poetic sensitivity. In the Brno Philharmonic's performances the brilliantly orchestrated works leave a durable impression." "Knehans's scoring is remarkable, muscular and yet never drowning the soloist." "This is hugely exciting music; the recording should be mentioned, too, as it carries a real punch and allows myriad details to shine through."